Two Texas A&M oceanographers are part of a NOAA $2.1 million nationwide initiative that seeks to improve the health of the nation’s oceans and coastlines. 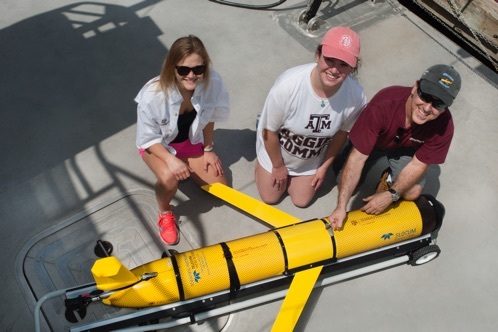 Elizabeth Ramey '16 and Allison Pace '15 with Steve DiMarco onboard Texas A&M-Galveston's RV Trident. 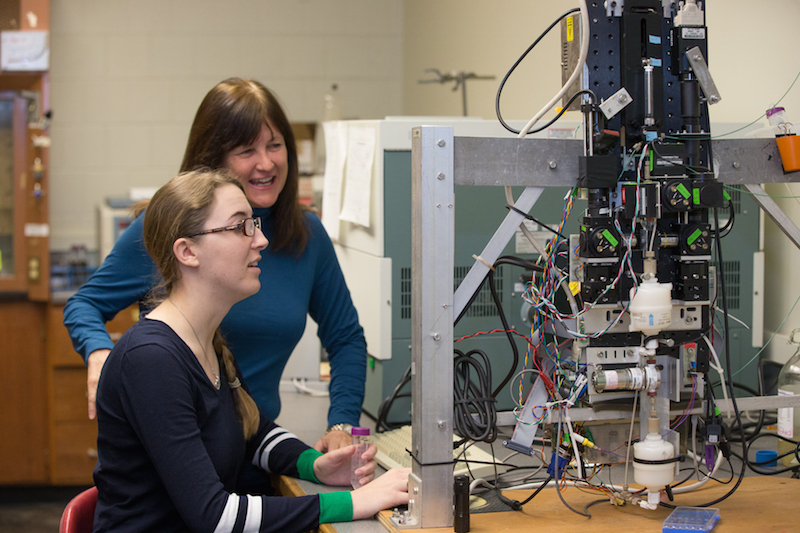 Mckensie Daugherty and Lisa Campbell use a lab-based Imaging Flow Cytobot. In separate proposals, Lisa Campbell and Steve DiMarco each plan a network of instruments that increases scientists’ ability to monitor harmful algal blooms and low oxygen in seawater, conditions that threaten the ecosystem, economic productivity and human health in the Gulf of Mexico and other bodies of water. Lisa Campbell, professor of oceanography in the College of Geosciences and professor of biology in the College of Science, is Principal Investigator for a grant that will improve the capability for mitigation of harmful algal blooms (HABs), also known as red tide. Campbell proposes to expand the network of underwater microscopes, instruments called Imaging FlowCytobots, that provide early warning of HABs. The Imaging FlowCytobot (IFCB), which is equipped with a camera system to capture high-resolution images of suspended particles, operates continuously at Port Aransas, Texas, and has given early warning for six HAB events since 2007. The new project will expand the early warning capabilities in the Gulf of Mexico by adding a new IFCB to the network, training additional end users, and improving management applications of this technology. “By expanding the early-warning capabilities in the Gulf of Mexico with a robust network and by training more people to gather information, we can develop a support system that helps us predict and respond to algal bloom events more efficiently,” Campbell says. Campbell and colleagues at Texas A&M, in partnership with scientists from Woods Hole Oceanographic Institution, will train and gain feedback on instrument performance from end users at the Texas A&M University at Galveston, Texas Parks and Wildlife Department, the Texas Department of State Health Services, the FDA, and a number of other universities. The NOAA grant will allow DiMarco, a professor in the Department of Oceanography and Ocean Observing Team Lead in the Geochemical and Environmental Research Group, to elevate his years of experience in researching the “dead zone” to the next level. The dead zone is a hypoxic condition that occurs when oxygen levels in seawater drop to dangerously low amounts, potentially resulting in fish kills and harm to marine life. One of the factors is nutrient pollution from farm fertilizers and other land-based sources as they empty into the rivers and eventually into the Gulf. The zone, which manifests mostly in summer, is influenced not only by the nutrient runoff but also by the volume of freshwater discharged and prevailing winds. As Principal Investigator for the project Mechanisms Controlling Hypoxia, DiMarco for the past 12 summers has chartered research vessels and hired scientists and crew members to take measurements. This summer he deployed gliders—autonomous underwater vehicles—to assess their effectiveness in measuring oxygen levels. Gliders can stay at sea longer for less money and cover a larger area than a typical research vessel, while continuously gathering information and sending it back to shore. DiMarco proposes to conduct two targeted field campaigns in 2016 and 2017, using the gliders to demonstrate their capability and operation robustness as a comprehensive approach to dead-zone monitoring. According to a news release from NOAA, hypoxia and harmful algal blooms have become a national concern that can shut down commercial and recreational fishing, threaten human health and upset the ecosystem from the Pacific to the Atlantic and in the Gulf of Mexico and the Great Lakes. The initiative is part of a larger NOAA effort to develop a nationwide network of ecological forecasts to protect coastal communities and public health.